Immobilized patients must be repositioned in their hospital beds to avoid bed sores. Embedded FSR technology can trigger a timing mechanism that can alert hospital staff to adjust the patient. Image courtesy of Tekscan. The Internet of Things (IoT) represents a growing wave of change that brings several new challenges to design engineers across all industries and markets. While it is a somewhat nebulous concept, IoT is broadly defined as a network of smart devices that communicate with one another wirelessly, with little-to-no direct human interaction. In general, physicians and patients are becoming more accepting of medical treatment methods that offer the best opportunity for patients to live a normal life. Human contact will always be an important part in all medical treatment, but the development of smart medical devices, systems, and equipment enables the ability to streamline several processes. However, smart medical devices alone are not necessarily prepared to function in an IoT world; they must also be equipped with properties that allow them to communicate freely with other devices. Embedded sensing technologies allow devices to take on human-like senses to see, hear, and even feel the world around them and generate an automatic action within a communication stream. Given the many diverse roles that tactile exchanges have in medical treatment, embedded force-sensing technologies can be the crucial touchpoints that enable a force-driven communication system between patients and their physicians. When developing a smart-connected, force-sensitive medical device or application, it is vitally important for design engineers to consider a force-sensing technology that can be incorporated seamlessly into a design. Force-Sensing Technologies: What are Your Options? The most common embedded force-sensing technologies include load cells, strain gauges, microelectromechanical systems (MEMs), and force-sensitive resistors (also known as piezoresistive sensors, or FSRs). Given application demands or design limitations, some force sensor types may be better options than others. Load cells are the most well-known force sensor technology and are great sensors for smart-connected medical applications that require a high level of force-feedback accuracy to trigger an action. While they are widely available from many technology suppliers, they tend to be difficult to embed into small, sleek devices, on account of their size, weight, and power requirements. Also, load cells may require routine factory re-calibration, which can become inconvenient and costly to the user. Strain gauges are another common embedded force sensor. They measure force as a result of an indirect measurement correlated to the strain of fine conductive wires. Although much smaller in size than load cells, strain gauges often require complex electronics to operate that may require outsourcing. This can be costly from an integration and production perspective. Like strain gauges, MEMs sensors are also very accurate and have the benefit of being small in size, allowing them to be embedded into compact spaces within a design. Again, though, their integration costs and complex circuitry present challenges during the design-in process. FSRs are ultra-thin and flexible force sensors consisting of semi-conductive material contained between two pieces of thin polyester. They are passive elements that act as a resistor in an electrical circuit. When unloaded, the sensor has a high resistance that drops as force is applied. Considering the inverse of resistance (conductance), the conductance response of touch sensors is linear as a function of force within the sensor’s designated force range. FSRs are more cost-efficient alternatives to the other force sensor types, given their ability to function on simple circuitry and their thin, minimally invasive form factor. They can also be produced in single-point or matrix forms, offering the ability to capture force or pressure feedback in the exact spots the design requires. Smart-connected medical devices deliver value by eliminating guesswork, tracking patient progress, or maintaining consistency of a given treatment process. As the following applications will demonstrate, any exchange in force can tell a story, and FSR technologies can be the critical components that translate force feedback into an actionable response. Wearable infusion pumps are a great way for a patient to receive the medications without having to take time out of their day for an injection. They are typically programmed to deliver medication to the patient at the time it is needed, and at the proper dosage. Over time, though, it is possible for blockages to occur, either within the delivery tube, or as a result of damaging impacts that may occur while in use. At left: Ultra-thin FSR technologies are commonly embedded into wearable infusion pumps to detect blockages. However, this force feedback data can also trigger alerts to the physician while the patient is on-the-go. Image courtesy of Tekscan. In general, most infusion pumps incorporate some form of force-sensing technology as a security measure to detect blockages. FSRs have shown to be a reliable technology for these applications on account of their thin form, small size, and their simple circuitry requirements. 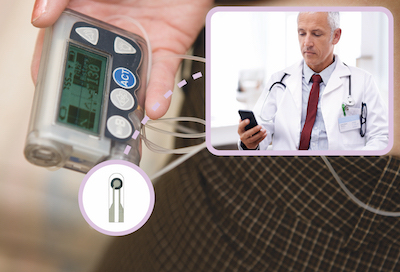 One way to develop a smart-connected infusion pump is to use the force-feedback data captured by the FSR to enable a wireless communication system between the physician and patient, right from the portable device itself. From a computer or mobile device, the physician can use this feedback data to monitor device use, determine whether the device is working properly, and even schedule a prescription refill. A similar force-enabled system could be developed for any medical device that makes contact with the human body, such as to measure occlusion of an injection pen. Significant physical injuries typically require patients to adjust their habits and use rehabilitative equipment—like wheelchairs, walkers, and crutches—to accommodate a treatment plan. However, patients may find themselves overcompensating the way they move while using this equipment, which can lead to soreness or other injury. Depending on the patient’s point in the recovery process, a physician may instruct the patient to increase or decrease movement and/or exercise. One way to provide assurance is by embedding force-sensing capabilities into this equipment to deliver use information to the physician. At left: Instrumenting rehabilitative equipment with minimally invasive force-sensing technologies can capture a stream of user data, which physicians can use to optimize treatment. FSRs embedded into contact areas on crutches or wheelchairs can be used to send a data stream to the physician’s computer or mobile device. This stream could contain real-time information on whether the patient is favoring one side of the equipment or the other and also help quantify the amount of time the equipment is in use. From this use data, the doctor can make recommendations to the patient to improve their recovery process, without needing to be present. Orthotic prescriptions and corrective footwear can be effective methods to treat diabetic ulcers. Even so, given the fact that no one patient’s condition is the same as the next, treating diabetic ulcers can become a subjective, guess-and-check process. Instrumenting footwear with an insole FSR matrix can be used to capture real-time walking pressure distribution and to monitor a patient’s walking pattern. 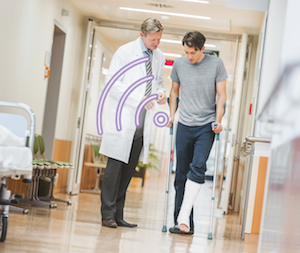 In a smart-connected, medical IoT application, the physician or podiatrist can monitor this real-time wireless data stream through a computer or mobile device, which may uncover abnormalities in the patient’s gait that may be aggravating the ulcer. This information may even identify whether peak pressure points change throughout the day, whether due to fatigue or pain. Based on this data, the physician can prescribe or modify an orthotic that can address the specific needs of the patient and continue to monitor progress while the patient is on-the-go. Hospitalized patients who are immobilized are often susceptible to bed sores or other health risks. To prevent these complications, nurses will routinely reposition patients in their beds to improve circulation. In a busy hospital, though, it may not always be easy to keep track of whether these patients have been tended to over a certain period of time. In a smart-connected IoT application, after a certain amount of time has passed, an alert can be sent to a nursing staff member’s pager or mobile device to adjust the patient’s position in their bed. Adults age 65 and older account for a large and growing portion of the world’s population. Therefore, there are far more people today that are at risk of health conditions, like dementia, which may need extra attention for their safety. Whether due to time commitments or financial reasons, it can be difficult for friends and families to provide the close contact their aging loved ones may need. In general, people follow a daily routine of going to bed and getting up at a certain time of day. As individuals get older, their routine more than likely becomes even more predictable. Integrating FSR technology into furniture or other devices can become an actionable method to keep caretakers connected to their vulnerable loved ones, even while far apart. For instance, a bed-side floor mat instrumented with an ultra-thin FSR system could be programmed to monitor when and how long the individual had left their bed. Once the individual steps on the force-sensitive mat, a countdown timer would be triggered. If the individual did not return to bed after a certain period of time, a text message or phone call could automatically be generated and sent to the individual’s caretaker to take an action. Not only does this smart-connected force-driven system allow at-risk individuals to live more independently, it also provides peace of mind to loved ones. 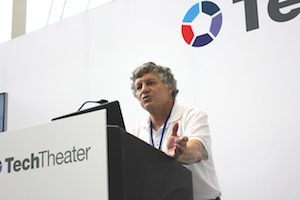 The goal for medical IoT concepts is not to altogether remove human contact from treatment regimens, but to streamline some of the more routine processes that can be easily overlooked or require extra guesswork. The applications shared in this article began with a design engineer thinking critically about how physicians and patients interact with one another from a force-feedback perspective. The more human-like touchpoints you can introduce to create a smart-connected medical device, the more we can enhance and improve standards for care in an IoT world. 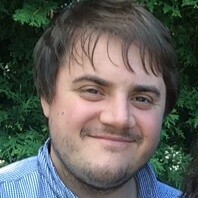 Rob Podoloff is the CTO for Tekscan Inc., a tactile sensor company he co-founded after completing his Master’s degree at MIT. Rob has spent the last 30 years developing new products and technologies in areas ranging from healthcare to interactive gaming to consumer electronics. Rob is a listed inventor on more than 20 U.S. patents. Andy Dambeck is a Content Specialist with Tekscan and has more than a decade of experience in producing content for healthcare and engineering audiences.